Along with the access to Internet is widely available, more and more documents becoming available electronically rather than paper files. Organizations are also pushing for paperless offices. Fax service has progressed from physical fax machines to internet-based fax service. Advantages of using eFax service are far beyond paper-based Fax. ICTO has implemented eFax service throughout the University since 2014. It is intended as a paperless service so that documents can be sent and received via eFax without the need of a physical fax machine and paper. It offers our staff a convenient way to send, receive and manage faxes directly from their computers. Eco-Friendly – Reduces the waste of paper, toner cartridges by receiving faxes on computer. Flexibility & Enhanced Productivity – Fax is sent to user’s eFax account and can be forwarded to the user’s email as attachment. User does not need to return to the office or stand by a fax machine to send and receive electronic documents. Secure – Confidentiality of faxes is increased. Faxes are no longer received by a fax machine which is easily accessed by other people. Reliability – Increases reliability and reduce the waste of time, as there is no chance of running out of paper or paper jams. Cost savings – Reduces costs by eliminating the need for standalone fax machine, toner & papers, maintenance of telephone line and hardware. Up to 10 March, 2017, there are 128 active eFax department accounts and 459 individual accounts in use, but there is no need to purchase any fax machine and to pay the service charge of individual telephone line. eFax account is available for the departmental use only and each department can apply one or more eFax extensions for official use. Please send your request to icto.helpdesk@umac.mo for application. Click “New Fax” in “Fax” menu. In the “Basic Information” tag, input a fax number in “Fax No.” field. 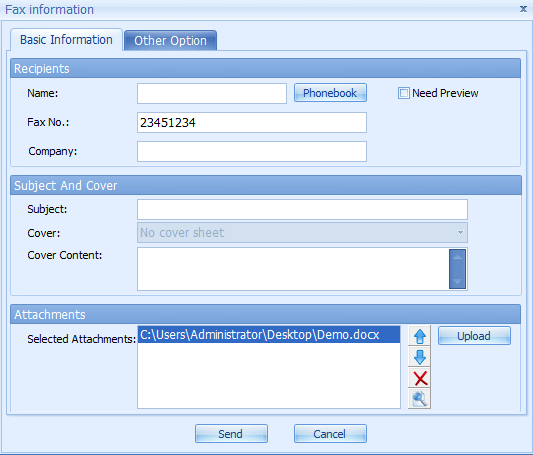 Click “Upload” to attach the document to the “Attachments” field. For international Fax, IDD code is required. Please add “,,” and the IDD authorization code after the fax number. If you want to receive the Fax from Email, you need to set the option with an eFax Thin Client. 1. Click “User Info Option” under the “Options” menu. 2. 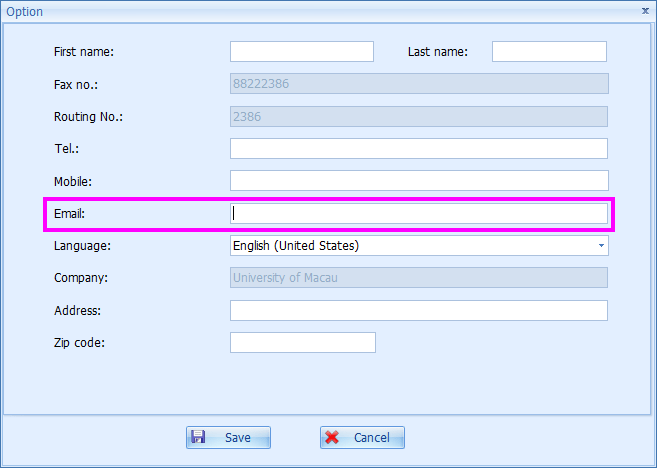 Input the email address for receiving new fax notification in the field “Email”. Please use a semicolon “;” to separate multiple email addresses. *Notes: If there are more than 3 specific email addresses, please apply an email group from ICTO Help Desk and input the email group in the field “Email”. Staff who want to know more about the eFax service, please visit the eFax service homepage and User Guide, or contact ICTO Help Desk.